The San Gorgonio Mountains in Southern California are home to a population of desert bighorn sheep. At least 20 bighorn have died in the past few months. Click on the link below to learn more about what is being done to investigate the causes of the mortality event, and the important collaborative roles played by California Fish and Wildlife field biologists and veterinarians, land owners, California Animal Health and Food Safety Laboratory, and volunteers. An understanding of the demography, distribution, behavior, and genetic diversity of animal populations enables the California Department of Fish & Wildlife to properly manage species statewide. Capturing bighorn sheep provides an opportunity to place GPS and VHF collars, as well as collect biological samples (e.g. blood, nasal swabs, hair, feces). This accumulation of data will offer insight into bighorn sheep population dynamics, genetic diversity, and overall health. From October through November of this year, CDFW participated in helicopter captures of multiple bighorn sheep populations. After ensnaring the sheep in a net, a capture crew member would exit the helicopter, secure the sheep by placing leg hobbles and an eye cover, and then either process the sheep in the field or place it in a carry bag for long-line transport to a base camp for processing. 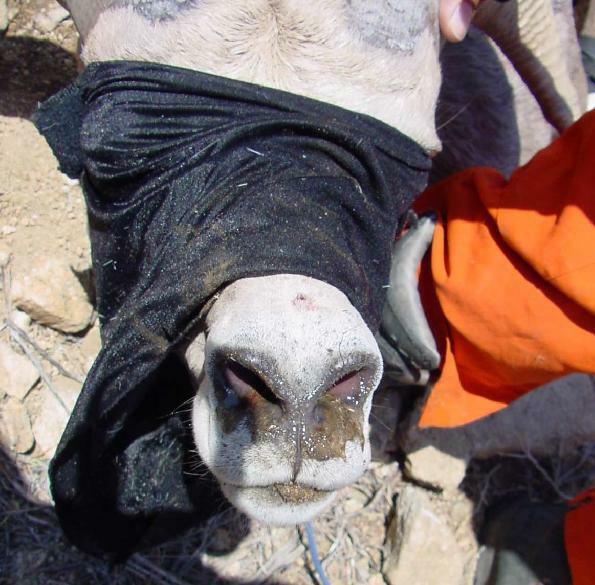 Processing at the base camp consisted of weighing the sheep, collecting morphometrics (body measurements), blood, hair, feces, and nasal swabs (for detection of Mycoplasma ovipneumoniae, a bacteria that can cause a fatal pneumonia), administering vitamin E and selenium injections, followed by GPS and/or VHF collar placement and ear tagging. Additionally, an ultrasound examination was performed to both determine body condition score by measuring the thickness of subcutaneous fat and particular muscle bodies, as well as check if any ewes were pregnant. Following processing, sheep were either released from the base camp or returned by helicopter to the capture site for release. Up first on the schedule were the endangered Sierra Nevada bighorn sheep. Over the course of six days in the Sierra Nevada Mountains, a total of 34 sheep were captured, including seven rams, with 33 sheep receiving at least one VHF or GPS collar (33 VHF, 31 GPS). Operations then moved to the Sespe Wilderness Area within Los Padres National Forest to capture desert bighorn sheep that had originally been translocated to the area, part of their historic range, back in the mid-1980s. This was quite the unique opportunity in that these sheep were thought to be all but gone from the range in the early 2000s and were only recently seen on the landscape. Furthermore, the population hadn’t been handled in the more than 30 years since their initial reintroduction. A total of 22 sheep were captured over three days, including 10 rams, with 19 sheep receiving at least one VHF or GPS collar (15 VHF, 13 GPS). The Sespe captures were followed by four days in Anza Borrego State Park and Palm Desert, CA for field processing of desert bighorn sheep from the Peninsular Ranges. These efforts yielded 42 total captures, all ewes, with each sheep receiving at least one VHF or GPS collar (18 VHF, 26 GPS). The capture team then moved to the Mojave Desert and Death Valley National Park for seven days of desert bighorn sheep processing, yielding 71 total captures, including 18 rams, with all but two sheep receiving both a VHF and GPS collar (69 VHF, 69 GPS). 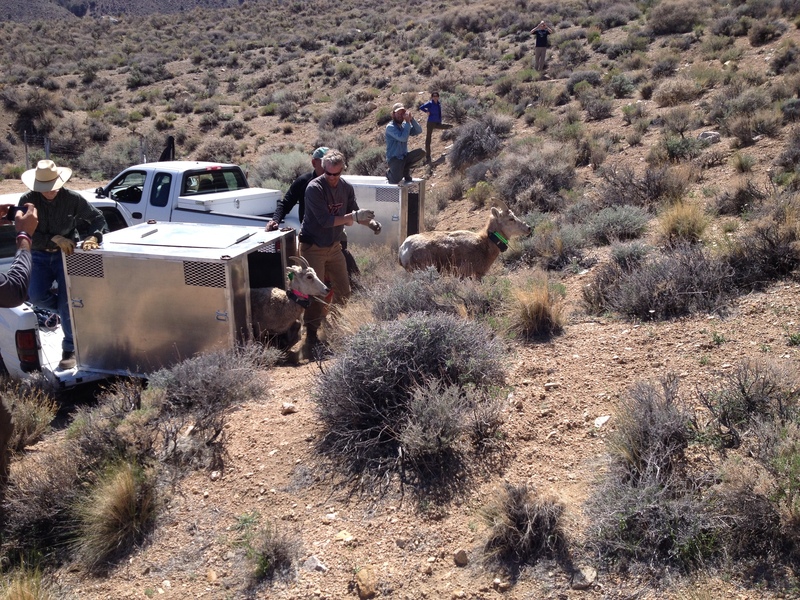 Capture operations wrapped up in the White Mountains just outside of Bishop, CA, where 33 desert bighorn sheep were captured over four days, including 12 rams, with all but two sheep receiving both a VHF and GPS collar (31 VHF, 31 GPS). 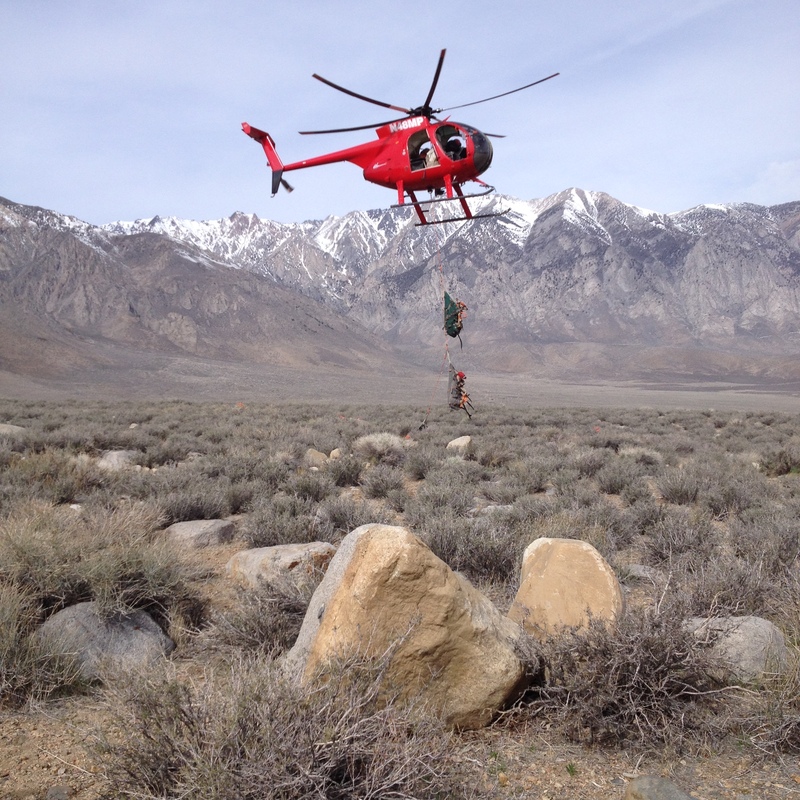 In less than one month, CDFW captured 202 bighorn sheep, placed 166 VHF and 170 GPS collars, and collected abundant biological samples that will be closely studied for the next few years. 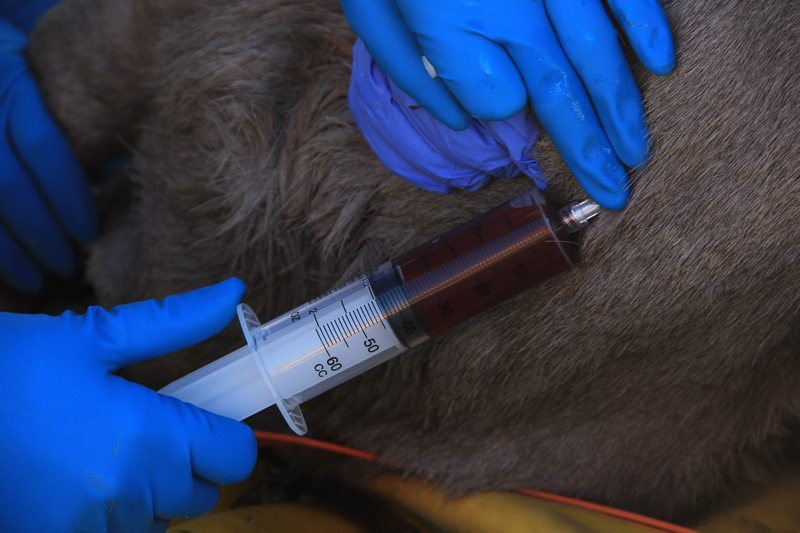 The information acquired through analysis of the biological samples, as well as the continual spatial data that the collars will generate, will provide CDFW with valuable material by which they can make educated and well-informed decisions regarding the management of the state’s bighorn sheep populations. Dr. Janet Moore (California Animal Health and Food Safety Laboratory – San Bernardino) instructs CDFW field staff in bighorn necropsy techniques. On Thursday, September 14, 2017, the California Animal Health & Food Safety Laboratory (CAHFS) and the California Department of Fish & Wildlife (CDFW), Wildlife Investigations Laboratory (WIL) hosted a bighorn sheep necropsy course at the CAHFS Diagnostic Laboratory in San Bernardino, California. Assisting with the course were Dr. Peregrine Wolff and wildlife technician Chris Morris from the Nevada Department of Wildlife (NDOW). In attendance were CDFW regional biologists, scientific aides, and veterinarians. 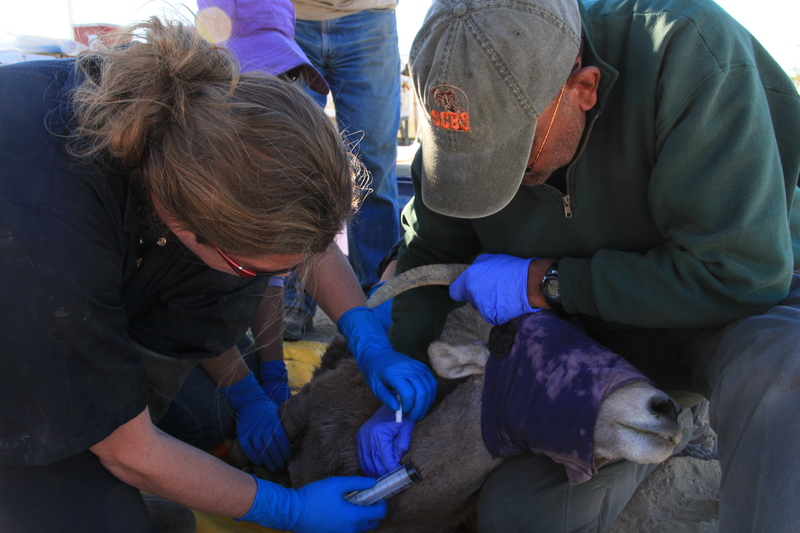 The course served as an opportunity for attendees to learn how to recognize, describe, and collect samples from bighorn sheep during field necropsies. It also provided a reminder of how important it is to keep domestic sheep populations separated from free-ranging bighorn populations in order to maintain healthy herds. After introductory remarks from Dr. Ben Gonzales (CDFW WIL), Dr. Francsisco Uzal (CAHFS) led a discussion on how to describe macroscopic lesions (i.e. distribution, size, shape, demarcation, color, consistency, contour) along with a review of the pathology of a few select domestic and bighorn sheep diseases. Dr. Francisco Carvallo (CAHFS) then expanded upon the main respiratory pathogens of bighorn sheep, which includes lungworms (Protostrongillus spp. ), bacteria (e.g. leukotoxin-positive Pasteurellaceae, Mycoplasma ovipneumoniae), and viruses (e.g. respiratory syncytial virus, parainfluenza-3 virus). 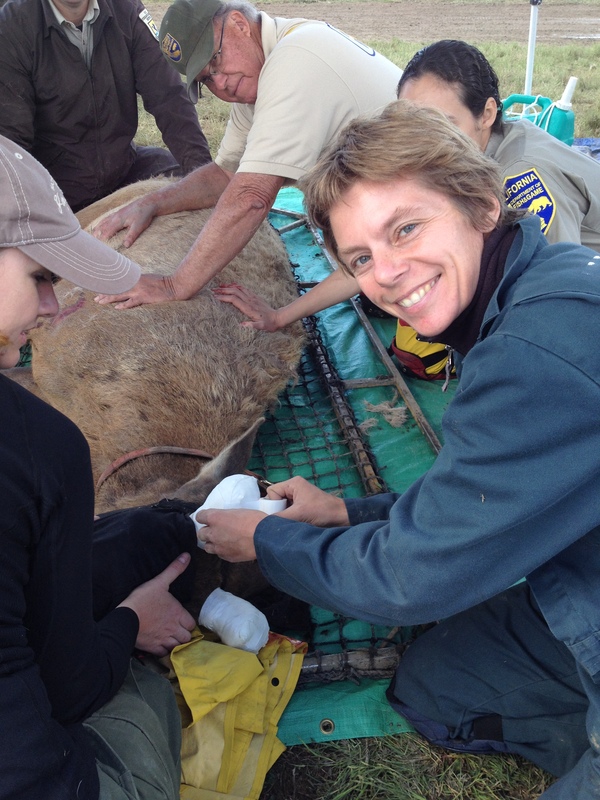 Following an important review of appropriate PPE (personal protective equipment) to utilize during bighorn sheep necropsies led by Meridith Rhea (CAHFS), Dr. Peregrine Wolff (NDOW) led a discussion on field necropsy techniques and nasal tumors of bighorn sheep to wrap up the morning session. The afternoon was spent observing a bighorn sheep necropsy demonstration performed by Janet Moore (CAHFS) and Akinyi Nyaoke (CAHFS). Attendees were then given the opportunity to perform their own bighorn sheep necropsies under the guidance of the aforementioned instructors, along with assistance from Karina Fresneda (CAHFS), Patricia Gaffney (CAHFS), Dr. Francsisco Uzal (CAHFS), Dr. Francisco Carvallo (CAHFS), Dr. Peregrine Wolff (NDOW), Chris Morris (NDOW), Dr. Brandon Munk (CDFW WIL), Dr. Ben Gonzales (CDFW WIL) and Dr. Andrew Di Salvo (CDFW WIL). Dr. Peregrine Wolff (Nevada Division of Wildlife) demonstrating locating sinus tumors in bighorn. This spring the Wildlife Investigations Laboratory assisted with 8 large mammal captures throughout California. Wildlife capture projects are conducted to help biologists and veterinarians assess the health of these herds through biological sampling, to place GPS collars on the animals to monitor movement and help study habitat use, and for translocating animals. 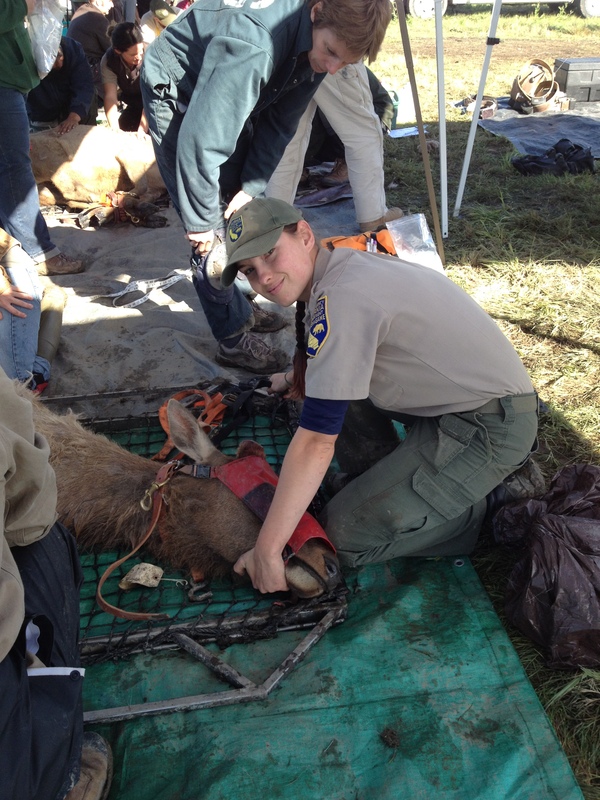 A total of 207 animals were captured including 132 deer, 21 pronghorn antelope, 36 elk and 18 bighorn sheep. Below is a small collection of photos from our month in the field. Stabilizing elk for transport to trailer for relocation to another site. San Luis Refuge, US Fish and Wildlife Service, Merced County. 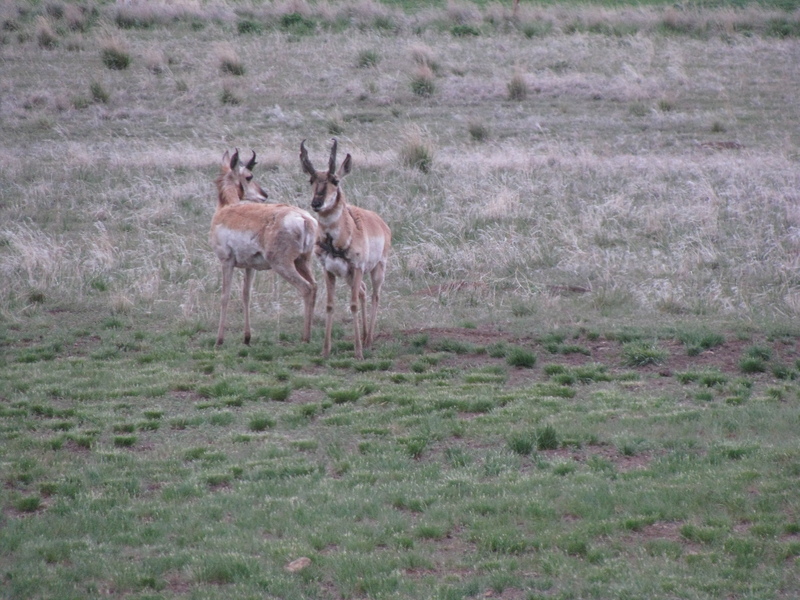 Pronghorn antelope, Modoc County. Photo by Richard Shinn. Translocation and release of Sierra Nevada bighorn to augment herd in Olancha, Inyo County. Early November 2013 was a busy time for Wildlife Investigations Laboratory staff. 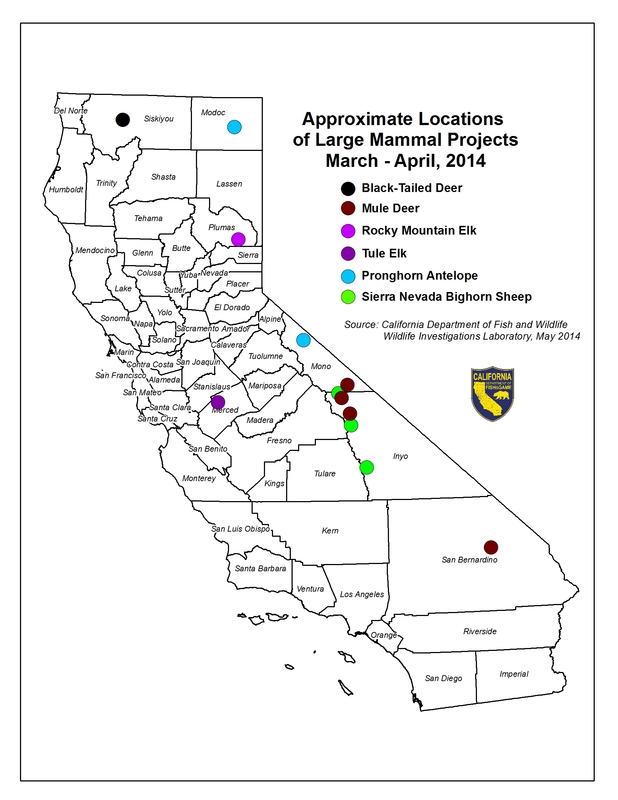 Two important disease surveillance projects for bighorn sheep were conducted in the Mojave National Preserve in San Bernardino County and the Peninsular Ranges in San Diego and Imperial Counties. A total of 91 sheep were captured, GPS collared for monitoring and biological samples taken so that a variety of disease tests could be done. One significant test is for Mycoplasma ovipnenumonia, a bacteria that caused a bighorn die-off in the Mojave earlier this year. Scientists will use the laboratory results (still pending) to determine the cause of the disease and to document the number of animals involved and the geographic extent of the outbreak. These projects could not have been conducted without the many partners involved including; The National Park Service, the Society for the Conservation of Bighorn Sheep, California Wild Sheep Foundation, United States Fish and Wildlife Service, Bureau of Land Management, Oregon State University and Colorado State University. Wildlife professionals from the National Park Service, California Department of Fish and Wildlife (CDFW) and conservation organizations have been investigating an outbreak of respiratory disease in desert bighorn sheep in the Old Dad Peak / Kelso area of the Mojave National Preserve. This was first reported in mid-May 2013. 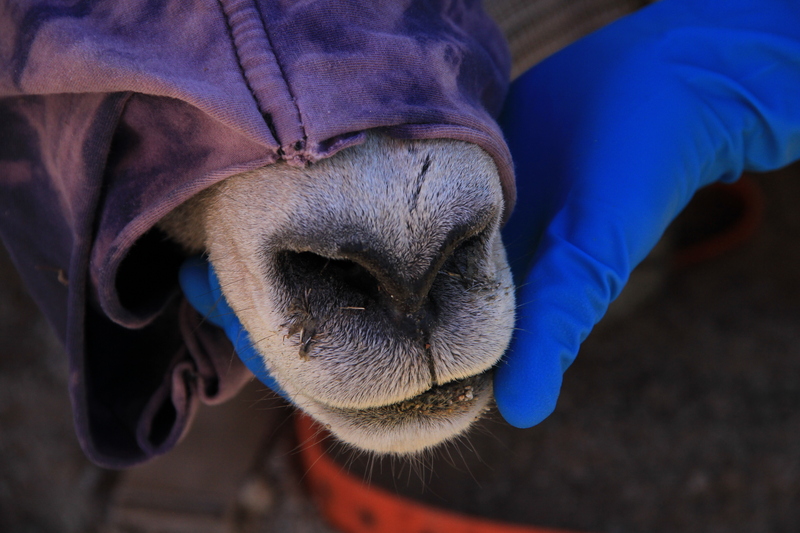 Two diseased bighorn have been collected and submitted to the state diagnostic laboratory in San Bernardino. Preliminary results confirm pneumonia. Currently surveys are being conducted to determine the geographic extent of the outbreak. So far, the disease appears to be limited geographically but monitoring will continue.